Luxury Suites & Spa at the Mandarin Oriental, Washington D.C.
Mandarin Oriental, Washington D.C. offers travelers a prime location near famous landmarks, great service and a relaxing spa. If you are looking for a luxury hotel in the nation's capital, you can't go wrong with the Mandarin Oriental, a hotel group famous for its impeccable service and luxury accommodations. You will have a choice of luxury suites and rooms, many with scenic views of the water. The property offers an array of dining options, perfect for a formal dinner or a casual lunch with a friend. Wedding facilities are top-notch as well, from grand ballrooms to meeting rooms and a beautiful garden. The spa offers a zen-like ambiance and a menu of holistic therapies from around the world with an emphasis on Asian-inspired treatments. Get a massage in one of the 8 treatment rooms or relax in one of the two dedicated beauty suites. After your massage, take a dip in the vitality pools, relax in the experience showers, steam room and sauna. Zen Relaxation Rooms provided the perfect spot to unwind on vacation. The Spa Boutique sells the best beauty products and gifts for those at home. The spa offers an array of special programs, including Full-Day Programs which are designed with the ultimate in pampering and relaxation in mind. The 6.5 hour program costs USD $685 on weekdays (USD $760 on weekends) and includes an 80-minute facial, lunch, manicure, pedicure and access to the spa facilities. 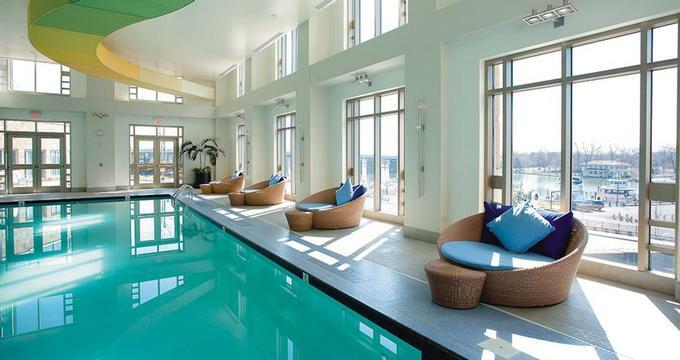 To stay fit on the road, swim laps in the 50-foot twin-lane swimming pool and work out at the fitness center. The 1,400-square-foot fitness center is offers a full range of TechnoGym training equipment. Pedal the stationary bike, do some resistance training, tone your abs at the ab station and train with free weights. For additional relaxation, enjoy a private yoga class in the garden to tone and relax. Some of the rooms and all of the suites give you access to the exclusive Tai Pan Club which has a beautiful lounge and library. Cozy up to the fireplace, have drinks at the bar and enjoy the views from the outdoor terrace which overlooks the Washington Monument. If you need a place for a business presentation, there is a display screen in the lounge. Guests also receive private check-in which means that you won't have to wait in line. Have European breakfast before you head to to a meeting or sightseeing. From 5 to 7pm, there is a cocktail and hors d’oeuvres reception, as well as snacks and fruit available all day. Ask for a Deluxe Water View Room with a view of the marina and Potomac river. These rooms feature elegant decor with dark wood furnishings and silk curtains. There is a sofa close to the window and a luxurious marble bathroom. If you are traveling with kids, adjoining rooms are available. Premier Water View Rooms are also a great choice. They are located at the corner of the hotel building and offer spectacular city views. Deluxe City View Room: The rooms measure 37 - 40 sq m (395 - 430 sq f) and have internet access, high definition LCD televisions, work desk, luxurious bathroom with bath and shower. Premier Water View Room : These accommodations measure 45 sq m (484 sq f) and have water views. Premier Water View Room: You'll be able to admire city views right from your bed, including Washington and Jefferson Monuments and the waterfront Tidal Basin. These rooms are great for both business and family travelers. They can accommodate two guests and measure 45 sq m (484 sq f). Tai Pan Club City View Room: You will get access to the exclusive Tai Pan Club when you stay in one of these 37-40 sq m (397-430 sq f) city view rooms. Tai Pan Club Water View Room is similar, but offers a view of the water. Tai Pan Club Premier Water View Room: Situated on the corners of the eighth floor of the hotel, these luxury rooms offer views of the Jefferson Memorial. All of the suites feature luxurious decor, dramatic views and access to the Tai Pan Club. Fantastic Family - Two Bedroom: If you are traveling with kids, this 73 sq m (790 sq f) water-view layout can accommodate up to 6 people in style. It is comprised of two Deluxe Water View rooms, one with a king bed and the other with two double beds. A great layout for a family getaway. Executive Two-Bedroom Family: The 98 sq m (1,060 sq f) suite has views over the marina, and city landmarks. Asian-inspired decor such as decorative vases and artwork makes these suites extra luxurious. Enjoy two full bathrooms in this spacious suite. Executive City View Suite: This 57-62 sq m (608-662 sq f) suite can accommodate up to 3 people. It features chic Asian style decor with classic American touches. The Executive Water View Suite is another great choice. Diplomatic: Take in dramatic views of the Washington Marina from this elegant 70 sq m (753 sq f) suite. Mandarin Suite: Enjoy floor-to-ceiling windows, 89sq m (958 sq f) of living space, and a bathroom with two round windows that let in plenty of natural sunlight. Ambassador: Enjoy landmark views from this 87 sq m (935 sq f) suite. Oriental Suite: The 112 sq m (1,208 sq f) suite located on the top floor of the hotel features water views. If you are planning to host a small elegant party, this suite is a great choice. Jefferson Suite: Named after the monument that can be seen from its windows, the 176 sq m (1,900 sq f) suite has two bedroom, a kitchen, dining room, sitting area and den. Presidential Suite: This stunning three-bedroom 327 sq m (3,512 sq f) suite is one of the largest in the city. It is located on the ninth floor of the hotel. The master bathroom is as luxurious as it gets, complete with an infinity edge tub and walk-in shower. Cityzen: The restaurant serves Modern American Cuisine and features an extensive collection of fine wine. Muze: The eatery offers Approachable Cuisine in an elegant setting. Empress Lounge: Enjoy Cocktails, Light Fare & Afternoon Tea in this stylish lounge. Plan a wedding your guests will never forget in one of the beautiful wedding venues at this luxury hotel. Plan a party for 900 guests in a ballroom or host an intimate event in one of the smaller spaces. The Catering & Culinary team will work with you to create the ultimate wedding menu. Grand Ballroom: Measuring 8,300, the ballroom features a square shape and stunning 18-foot ceilings. It can seat up to 770 guests for a banquet and accommodate 900 guests for a drinks reception. Oriental Ballroom: This stylish venue can accommodate up to 350 guests for a banquet and up to 600 for a drinks reception. Hillwood Room: Located adjacent to the Oriental Ballroom, the room offers plenty of natural light. Art Gallery: Plan a smaller gathering in this unique space with views of the Jefferson Memorial. Garden Rooms, Zen Garden and Event Lawn: The 4,000 square foot Event Lawn offers spectacular sunset views and is a great place to host an evening cocktail party. Room rates start at $335 USD per night. The hotel offers great specials and packages for couples, families and business travelers. The deals are seasonal. "Luxury Breaks" starts at USD $395 and includes: dining or spa credit of USD 50 per day (USD 100 for suites). "Extra Fun Day Away" starts at USD $395 includes a complimentary night with two or more consecutive paid nights. "Suite Temptations", starting from USD $525 includes: free 4th night, breakfast, $50 spa credit and a VIP gift.